After our stop at the Falkirk Wheel, we headed on to Stirling. By the time we had eaten a late lunch, the rain had let up and we decided to go ahead with a visit Stirling Castle. We only had a couple of hours before closing time, but since we'd already purchased a Scottish Heritage Pass it was still worth it. As it turns out, I enjoyed our tour of this castle more than the Edinburgh Castle. There were more nooks and crannies to explore devoid of people. The weather earlier in the day kept the tourists away, so, for the most part, it felt as if we had the place to ourselves. 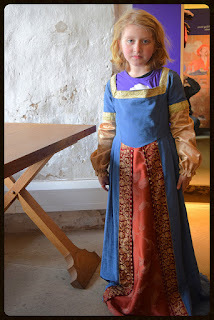 In addition, there was a great kid-friendly area in the lower recesses of one of the buildings with age appropriate exhibits and a dress-up area. Like so many of the Scottish castles, Stirling Castle was built atop a rock promontory that dominates the surrounding area. The views from the castle are superb. We could easily see the William Wallace Monument (most Americans are familiar with him as the main character in Braveheart) and the spot on the river where he lead Scottish soldiers to victory over the British at Stirling Bridge. After leaving the castle, we stopped for a brief walk around the Bannockburn battlefield and a statue of Robert the Bruce astride his armored steed. We ended our day in Stirling at Broomhall Castle: our first and only stay in a bed and breakfast during the entire trip. The beds were nice but the breakfast was hearty and delicious; I didn't know a traditional Scottish breakfast included mushrooms. Yum! We left there tanked up and ready for another day of driving and sightseeing.